Restored in 2012 by the National Museum of Singapore and Cineteca di Bologna/L’Immagine Ritrovata laboratory, in association with The Film Foundation’s World Cinema Project, Konfiden Foundation, Kineforum of the Jakarta Arts Council, and the family of Usmar Ismail Estate. Restoration funded by Doha Film Institute. 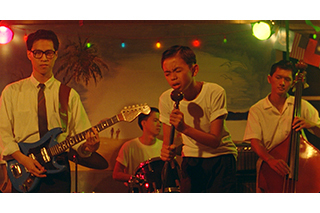 Lewat Djam Malam has been digitally restored using the original 35mm camera & sound negatives, interpositive, and positive prints preserved at the Sinematek Indonesia. The original camera negative was scanned at 4K resolution. The digital restoration began by focusing on fixing instability and flicker followed by the meticulous work of dirt removal, carried out both by automatic tools and by a long manual process of digitally cleaning each image (frame by frame). The film also suffered from signs of mould and vinegar syndrome –the laboratory took great pains to address these problems without damaging the definition of the photographic output, specifically with regards to details and faces. The original sound was digitally restored using the 35 mm original soundtrack negative. Two reels were missing from the soundtrack negative, and were therefore taken from the combined interpositive. The last 2 minutes of reel 5 were missing from all available elements, but were recovered from a positive copy. The soundtrack has been scanned using laser technology at 2K definition. The core of the digital sound restoration consists on several phases of manual editing, high resolution de-clicker & de-crackle, and multiple layers of fully automated noise reduction. The restoration was completed at L’immagine Ritrovata laboratory on March 2012. 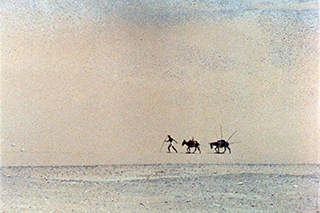 Momia, which is commonly and rightfully acknowledged as one of the greatest Egyptian films ever made, is based on a true story: in 1881, precious objects from the Tanite dynasty started turning up for sale, and it was discovered that the Horabat tribe had been secretly raiding the tombs of the Pharaohs in Thebes. A rich theme, and an astonishing piece of cinema. The picture was extremely difficult to see from the 70s onward. I managed screen a 16mm print which, like all the prints I’ve seen since, had gone magenta. Yet I still found it an entrancing and oddly moving experience, as did many others. 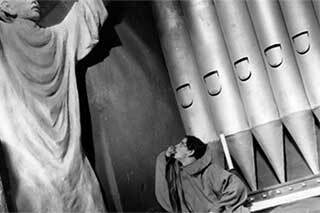 I remember that Michael Powell was a great admirer. Momia has an extremely unusual tone – stately, poetic, with a powerful grasp of time and the sadness it carries. 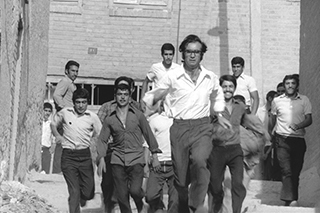 The carefully measured pace, the almost ceremonial movement of the camera, the desolate settings, the classical Arabic spoken on the soundtrack, the unsettling score by the great Italian composer Mario Nascimbene – they all work in perfect harmony and contribute to the feeling of fateful inevitability. Past and present, desecration and veneration, the urge to conquer death and the acceptance that we, and all we know, will turn to dust… a seemingly massive theme that the director, Shadi Abdel Salam, somehow manages to address, even emobody with his images. Are we obliged to plunder our heritage and everything our ancestors have held sacred in order to sustain ourselves for the present and the future? What exactly is our debt to the past? The picture has a sense of history like no other, and it’s not at all surprising that Roberto Rossellini agreed to lend his name to the project after reading the script. And in the end, the film is strangely, even hauntingly consoling – the eternal burial, the final understanding of who and what we are… am very excited that Shadi Abdel Salam’s masterpiece has been restored to original splendor. The restoration of Al Momia used the original 35mm camera and sound negatives preserved at the Egyptian Film Center in Giza. The digital restoration produced a new 35mm internegative. 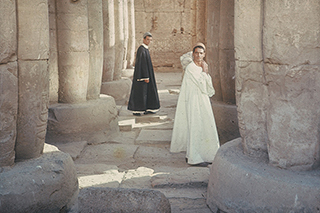 The film was restored with the support the Egyptian Ministry of Culture. Restored by Cineteca di Bologna/ L’Immagine Ritrovata laboratory, in association with the Sembène Estate, Institut National de l’Audiovisuel, INA, Eclair laboratories and the Centre National de Cinématographie. Restoration funded by The Film Foundation’s World Cinema Project. 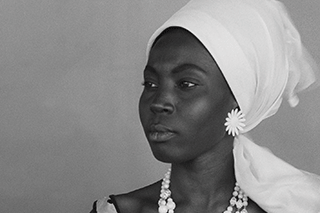 Black Girl, or La Noire de…, was the first of Ousmane Sembène’s pictures to make a real impact in the west, and I can clearly remember the effect it had when it opened in New York in 1969, three years after it came out in Senegal. An astonishing movie—so ferocious, so haunting, and so unlike anything we’d ever seen. I am not for “social realism” nor for a “cinema of signs” with slogans and demonstrations. For me revolutionary cinema is something else. If we managed to set up a group of cinéastes who all make cinema directed in the same direction, I believe that then we could influence a little bit of the destinies of our country. I think that the film, more than the book, can crystallize an awakening within the masses. I am personally inspired much by the example of Brecht. In 1961, shortly after Senegal declared its independence from France, Ousmane Sembène, a self-educated dockworker, assigned himself an impossible task: to create a true African cinema as a “night school” for his people. is explosive debut—a film described as the first African feature (true in spirit, if not in fact)—inspired a form of fearless, socially engaged, and uncompromising cinema across the globe. La Noire de … (Black Girl) follows a young girl lured to France by a white bourgeoisie couple, who keep her locked in their flat as a housekeeper. As the daily and unrelenting indignities unfold, Diouana, the title character, literally loses her voice. Sembène highlights her silence, familiar to the voiceless across the globe, yet reveals Diouana’s immense dignity and, by the end, agency. He draws visually from the French Nouvelle Vague (in a film about racial and class divides, the black-and-white photography carries new power) and spiritually from the Italian neorealists, but the film’s heart and soul is African. By turning around the camera—used for 100 years to demean Black people—Sembène offers us the first humanistic gaze at Africans. 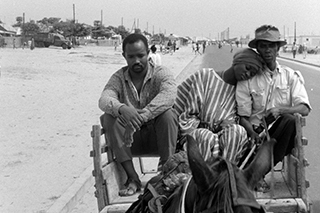 But the film (shot mostly in Dakar) also remains a seminal work of cinematic art, as it unfolds with startling precision and decisiveness, providing revealing, unforgettable and richly metaphoric perspective on a never-beforeseen Africa. La Noire de … became a sensation at festivals from Carthage to Pyongyang, and Sembène became the first non-French recipient of the Prix Jean Vigo, given previously to Alain Resnais, Chris Marker, Claude Chabrol and Jean-Luc Godard. In the film’s culminating moment, a boy grabs a mask and haunts the white businessman who entrapped Diouana. As this child pulls the mask from his face, we wonder: Will a new Africa emerge? Nearly 50 years after its initial screenings, the visionary La Noire de … remains a gorgeous, shocking and of-the-moment African story. In order to try and minimize the presence of visible spots (due to processing errors and aggravated by time) and scratches on the image, the camera negative was wet-scanned at 4K resolution. Due mainly to these two issues, the digital restoration required considerable efforts. A vintage print preserved at the Cinémathèque Française was used as reference. I think given the fact that there is such a diversity of languages in Africa, we, African filmmakers, will have to find our own way in order to ensure that the message be understood by everyone, or we’ll have to find a language that comes from the image and the gestures. I think I would go as far as to say that we will have to go back and see some of the silent films and in that way find new inspiration. Contrary to what people think, we talk a lot in Africa but we talk when it’s time to talk. There are also those who say blacks spend all of their time dancing – but we dance for reasons which are our own. Dancing is not a flaw in itself, but I never see an engineer dancing in front of his machine, and a continent or a people do not spend its time dancing. All of this means that the African filmmaker’s work is very important – he must find a way that is his own, he must find his own symbols, even create symbols if he has to. [...] I then realized Borom Sarret, my first true short film. It is the story of a cartman who is, to some extent, the taxi driver of a horse-drawn cart. Confronted by a rich customer in a residential district prohibited to such a type of vehicle, a cop stops him, makes a complaint, and seizes the cart. Relieved of his livelihood, the poor fellow remains sadly in his place. His wife entrusts the guardianship of their children to him while saying to him “We will eat this evening…” For this I got the first work prize at the Festival of Tours in 1963. The restoration of Borom Sarret was made possible through the use of the original camera and sound negatives provided by INA and preserved at Éclair Laboratories. The film was scanned in 4K at Éclair Laboratories and restored at L’Immagine Ritrovata laboratory. The image was digitally stabilized and cleaned, and all wear marks were eliminated. Image grading helped recover the richness of the original cinematography. After scanning, the sound was digitally cleaned and background noise reduction was applied to eliminate all wear marks, without losing any of the dynamic features of the original soundtrack. The World Cinema Foundation would like to specially thank Alain Sembène and the Sembène Family for facilitating the restoration process. Restored by the Cinémathèque Royale de Belgique in collaboration with Hou Hsiao-hsien and The Film Foundation’s World Cinema Project. I tried to recount, with dignity and nobility, this uprising that then became the Algerian Revolution, an uprising not only against the coloniser, but against a certain human condition. I wanted to avoid any kind of Manichaean, caricatural and demagogic approach, which risked turning Waqai sanawat al-djamr into a sort of Western; good against evil, Algerians against French. What guided me was the quest for honesty: I looked inside myself for the honesty of a child, the eyes of the child I once was, the memories of my childhood. 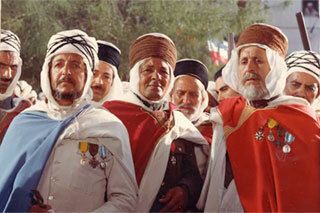 […] It would be a serious mistake to distinguish Algerian Cinema, the cinema of the Maghreb, from African Cinema. The cinema of the Third World is one – the Arab World, Africa, Latin America, the Middle East, Asia – as we share the same motivations, the same difficulties, and a common destiny, on an artistic level and on an expressive level. We have suffered hunger and thirst. We will reclaim our image. Restored in 4K from the original camera and sound negatives and a first generation 35mm interpositive provided by the filmmaker. 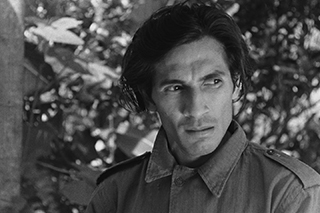 Three different cuts exist of this film: upon Mohammed Lakhdar-Hamina's wish, this restoration reconstructed the version that was awarded the Palme d'or at the Cannes Film Festival in 1975. The original camera negative, outtakes from the same element, and the interpositive were integrated to match a 35mm vintage print provided by the filmmaker as a reference. Color grading was supervised by Mohammed Lakhdar-Hamina. 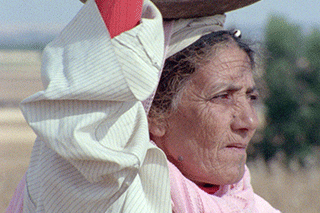 Restored in 2008 by Cineteca di Bologna/L’Immagine Ritrovata laboratory, in association with The Film Foundation’s World Cinema Project, Ulvi Dogan, and Fatih Akim. Additional elements provided by the Friedrich Wilhelm Murnau Stiftung. Restoration funded by Armani, Cartier, Qatar Airways and Qatar Museum Authority. The restoration of Susuz Yaz used the original 35mm camera negative and the original 17.5 mm sound negative and recaptured the black and white film’s tonal nuances. The film’s producer, Ulvi Dogan, provided the prints. An interpositive preserved at the Friedrich Wilhelm Murnau Stiftung in Wiesbaden was used for the negative’s last missing reel. The opening and closing credits, missing from all available sources, have been digitally reconstructed. Based on one of the major literary texts survived from the Middle Kingdom, the classical period of Egyptian literature, The Eloquent Peasant is a combination of a morality/folk tale and a poem. The events are set between 2160 and 2025 BC. When the peasant Khun-anup and his donkey stumble upon the lands of the noble Rensi, the peasant’s goods are confiscated and he’s unjustly accused of theft. The peasant petitions Rensi who is so taken by the peasant’s eloquence that he report his astonishing discovery to the king. The king realises the peasant has been wronged but delays judgement so as to he can hear more of his eloquence. The peasant makes a total of nine petitions until finally, his goods are returned. The Eloquent Peasant has been restored using the original 35mm camera and sound negatives preserved at the Egyptian Film Center in Giza. The digital restoration produced a new 35 mm internegative. Special thanks to the Bibliotheca Alexandrina.